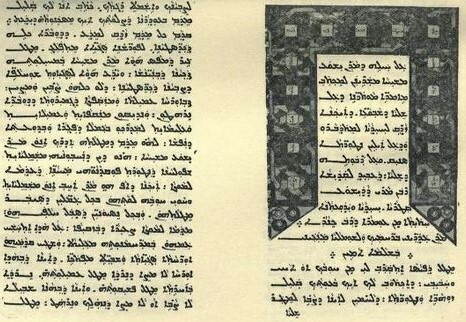 Christian documents in Syriac, Arabic, and Garshuni, edited and translated with a critical apparatus. Observacao: garshuni é arábico escrito com o alfabeto aramaico. The ” Woodbrooke Studies ” will consist of texts and translations of Christian documents in Syriac, Arabic, and Garshuni drawn from the manuscripts forming part of my own collection, which, for the time being, is in the custody of the Rendel Harris Library, Selly Oak, Birmingham. These Studies will appear first in serial form in the columns of the ” Bulletin of the John Ry lands Library,” which is published twice during the course of the year, in the months of January and July. At the end of each year they will be issued in a separate volume uniform with the present initial issue. A Treatise of Bar Salibi against the Melchites (aramaico). Genuine and Apocryphal Works of Ignatius of Antioch (garshuni). A New Life of John the Baptist (garshuni). Timothy’s Apology for Christianity (aramaico). The Lament of The Virgin (garshuni). The Martyrdom of Pilate (garshuni). Commentary of Theodore of Mopsuestia on the Nicene Creed (aramaico). A. Mingana, Woodbrooke Studies. Christian documents in Syriac, Arabic and Garshuni, edited and translated with a critical apparatus. 7 vols. W. Heffer & Son: Cambridge, 1927-34. Textos em Aramaico com tradução em Inglês. Textos em Aramaico, com reproduções em facsímile do manuscrito. Escrita Serto.